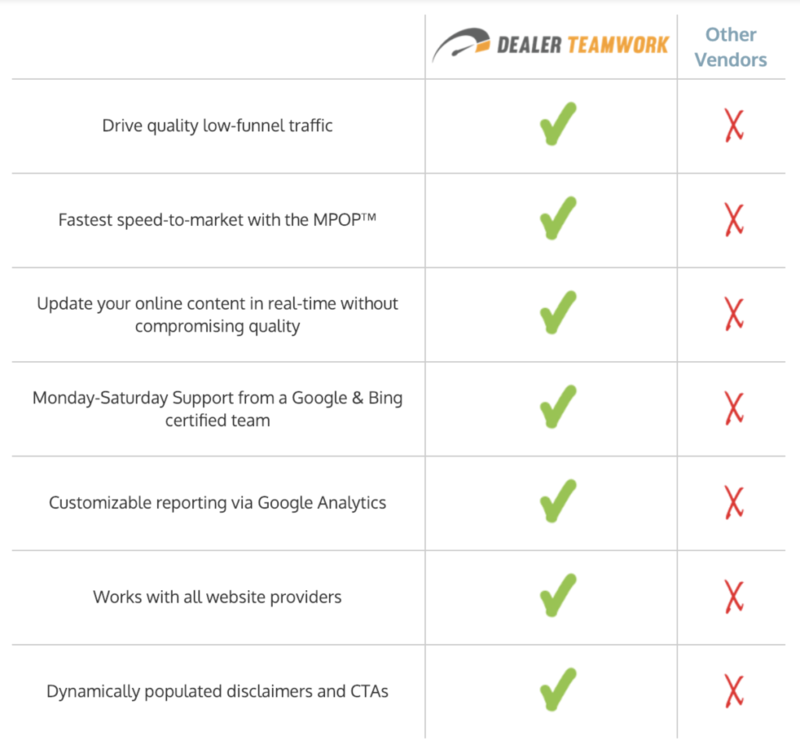 Dealer Teamwork helps dealers build relevant content for organic search, paid search, social media, and email marketing – in real-time! Increase leads and quality of traffic by delivering relevant messages to shoppers in the moments that matter. Our patented software, the MPOP®, creates marketing campaigns that reach more in-market buyers and drives more lead opportunities than ever before. The MPOP®, our patented content management, and cross-channel content syndication platform empowers you with instantaneous speed-to-market. It also has built-in quality assurance tools that guide you to build highly relevant and top-quality marketing content. The MPOP® is the most dynamic and unique marketing automation platform available. Highly relevant content increases traffic while reducing costs. Account and search managers are Google and Bing certified so you get the best support and guidance. Maximize your SEO and SEM with our highly trained team. Right message. Right place. Right people. Deliver content that answers key questions and is easy to find by in-market shoppers. Change the way you create, distribute, and manage great marketing.